Richard Nixon liked space flight. “I can remember Nixon coming off a phone conversation with the astronauts,” John Ehrlichman recalls. Like other presidents before and since, he basked in the reflected glory of spacefarers. When the crew of Apollo 11 returned from the first landing on the moon, he was aboard the aircraft carrier USS Hornet to greet them. He then used this triumph to gain diplomatic advantage, for after hailing the achievement, he set out on a nine-day world tour that took him to capitals in Southeast Asia, India, Pakistan, and Europe. Significantly, he had planned this tour well in advance of the Apollo 11 flight, anticipating its safe return. “The President had rather daringly pegged his trip to the success of this operation,” Tom Paine later remarked. Yet while Nixon willingly embraced Apollo, which he had inherited from Lyndon Johnson, he took his time in committing the nation to new initiatives, whether in space or in other areas of technology. Between 1960 and 1980, such civilian initiatives were largely a province of Democrats: Kennedy and Johnson with Apollo and NASA, Jimmy Carter with his ambitious synthetic-fuels program in the late 1970s. When George Shultz presented Nixon with NASA’s plan for the space shuttle and urged him to accept it, he did. Having completed that long stride into the future which has been our objective for the past decade, we now must define new goals which make sense for the Seventies. We must build on the successes of the past, always reaching out for new achievements. But we must also recognize that many critical problems here on this planet make high priority demands on our attention and our resources. By no means should we allow our space program to stagnate. But-with the entire future and the entire universe before us-we should not try to do everything at once. Our approach to space must continue to be bold-but it must also be balanced…. We must realize that space activities will be a part of our lives for the rest of time. We must think of them as part of a continuing process — one which will go on day in and day out, year in and year out — and not as a series of separate leaps, each requiring a massive concentration of energy and will and accomplished on a crash timetable…. We must also realize that space expenditures must take their proper place within a rigorous system of national priorities. Nixon died very hard on the SST, and he had a commitment to that which had to do with chauvinism, I think, is the proper word. We had to be at the leading edge of this kind of applied technological development. And if we weren’t, then a great deal of national virtue was lost, and our standing in the world and all that. He was terribly troubled to go to an international conference and have the French president arrive in an SST. That was why that was very hard on him. The activity began on July 1, when Ehrlichman sent letters to 15 agencies, asking for proposals. The responses went to the Office of Science and Technology, where Edward David’s staff carried out initial evaluations. Then in September, Nixon bypassed David as head of this program, even though David had come up within Bell Labs as a technologist, and even though his purview specifically included technology. In an action that effectively downgraded this side of David’s domain, Nixon named Magruder as head of NTOP. The OST staff continued its assessments, but Magruder broadened the review to include people from the Treasury Department and the Council of Economic Advisers. Magruder also worked with the OMB’s Donald Rice, who assigned a staff member, Hugh Loweth, to work full-time on budgetary aspects. The reviewers quickly discovered, however, that the prospective domestic initiatives carried difficulties that ranged well beyond the merely technical. One important proposal called for full-scale development of high-speed rail transportation in the Northeast, laying new rail and refurbishing passenger stations. The New York Central and Pennsylvania railroads, recently merged into the Penn Central, had allowed this service to deteriorate badly; the Penn Central had gone bankrupt in 1970. Yet its tracks and rights-of-way were still serviceable. [National Journal: October 23, 1971, pp. 2114-2124; October 30, 1971, pp. 2156-2163; May 6, 1972, pp. 756-765; Audacity, Summer 1993, pp. 52-62. “We pushed that pretty hard,” said Lawrence Goldmuntz, who directed the OST’s proposal evaluations. And who can argue that it shouldn’t be a high-priority item? But in analyzing that proposal the White House also had to take into account the fact that there are several thousand government jurisdictions involved, that the Penn Central is not the most popular railroad in the country today, that it might get athwart union work rules-and well, a number of complicated issues like this came up. Other proposals ran afoul of recent changes in the national mood. The Atomic Energy Commission had a long-running interest in peaceful uses of nuclear explosives. Its officials endorsed a demonstration project that would use multiple detonations to fracture impermeable rock formations that held natural gas. The concept gained high marks from Magruder’s reviewers; the AEC plan even seemed to promise commercial feasibility. However, 1972 was an election year, and with environmentalists showing their strength, the Administration could not touch it. Still other proposals faced political opposition, such as a plan to build offshore terminals for deep-draft supertankers that drew too much water to enter conventional ports. Such terminals promised to cut shipping costs by eliminating the need to route the supertankers to the Caribbean, where they would transfer their cargoes of oil to smaller tankers of lesser draft. This proposal, however, faced strong opposition from governors of states in the Northeast, who feared oil spills. It also would have tended to push the White House toward endorsing expansion of oil imports, a policy that Nixon was reluctant to support. Four senior White House officials carried out the final review: John Ehrlichman, head of the Domestic Council; OMB director George Shultz; Peter Flanigan, special assistant to the President; and Peter Peterson, director of the Council on International Economic Policy. They declined to endorse any of Magruder’s proposals, and the main reason was that in the course of the NTOP exercise, key people had come to realize that they truly knew little about the process of technological innovation. By Christmas, NTOP was moribund. It is a matter of record that as the NTOP fell, the Space Shuttle rose and won Nixon’s approval. The latter event, however, did not follow from the former. Edwin Harper, assistant director of the Domestic Council, told National Journal, “I was at all the relevant meetings and the two programs were never discussed in terms of a trade-off. The timing of the space-shuttle decision had an independent history.” Both NTOP and the shuttle had to stand on their respective merits; in the end, only the Shuttle survived the cut. In either case, NASA would plan to replace all of the U.S. expendable booster programs with the Shuttle. Thus, one program, the Shuttle, would dominate NASA for the coming decade, as did Apollo in the 1960’s. This would make efforts to reorient NASA to domestic pursuits more difficult, and tend to starve unmanned earth applications missions for resources. — small systems with an unpowered reusable orbiter and a non-reusable launch vehicle ($3 B). The revised program proposed in this memorandum would develop a smaller reduced cost version of a manned reusable Shuttle with an investment of $4-5 billion over the next 8 years-less than one-half NASA’s original proposal. Nixon took about a week before he read and accepted the OMB memo. On Saturday, December 11, Fletcher and Low met with Rice, David, and Flanigan. These NASA officials learned that Nixon indeed had decided to go ahead with the shuttle — provided that it was the downsized version of the OMB. This brought considerable and heated discussion. Fletcher finally declared that he could not accept such a decision, and that he wanted to see the President. This meeting did not take place, for Fletcher subsequently decided that he would not help his cause by staging a confrontation with Nixon. Fletcher nevertheless would fight for a larger Shuttle, and in doing this, he would stand for NASA in the fashion of his predecessors. Paine had been the visionary, pushing toward Mars. Low had succeeded Paine; as Acting Administrator, he pushed strongly for two-stage fully-reusable designs. He also sought OMB approval to initiate Shuttle development during FY 1972, and won permission to proceed with the SSME on such a schedule. By contrast, Fletcher had acquiesced to OMB pressure from the outset, abandoning the high-cost alternatives as he struggled to meet the OMB’s stringent cost limits. He still had a limited amount of wiggle room, and he would make the most of it. Though the OMB memo to Nixon specified a development cost, it did not state a payload size or capacity. The OMB presented its numbers separately in a paper for NASA: 10 x 30 feet, 30,000 pounds. Low responded quickly; on Monday, December 13, he sent a memo to Dale Myers that asked for an in-house assessment of this OMB shuttle, to be completed by the end of the month. In this assessment, Myers was to try once more for the full-capacity Shuttle of 15 x 60 feet and 65,000 pounds, by comparing its merits with those of the OMB’s configuration. Fletcher, however, had to prepare once again to give ground. The OMB was willing to permit NASA to build its shuttle with the SSME; it was willing to bypass the interim Phase I orbiter with its J-2S engines. The OMB also would allow a booster “of the reusable pressure-fed type,” which Low had recommended. Nevertheless, while rejecting the OMB’s small payload size and weight, Fletcher and Low had to find new ways to save money and to cut the developmental cost anew. With OMB ready to toss the Air Force’s payload bay out the window, and with the OMB calling for continued use of the Titan III for large Air Force payloads, it was appropriate to take a fresh look at another Air Force requirement, which had demanded a crossrange of 1100 nautical miles. This had been a prime reason for the choice of a delta wing for the orbiter, which drove up the weight of the Shuttle and increased its cost by requiring more thermal protection. With the OMB now pressing NASA to return to the payload capacity recommended by Max Faget, the agency had to consider whether it might cut costs by also returning to Faget’s straight-wing orbiter design. Charles Donlan, acting director of the Shuttle program office, ruled this out. In a memo to Low, he emphasized that high crossrange would be “fundamental to the operation of the orbiter.” It would make the Shuttle maneuverable, greatly broadening the opportunities to abort a mission and perhaps save the lives of astronauts. A high crossrange would also afford frequent opportunities to return to Cape Canaveral in the course of a normal mission, following launch from that site. The requirements which he was particularly concerned about were the cross-range requirement, and payload requirement, and the size requirement. He felt that the cross-range requirement might have been an artificial one and although he didn’t fully understand the implications of it felt that if it were causing difficulties, it could easily be modified. I assured him that the diameter requirement came primarily from NASA and not from the Air Force, but that the length probably came from the Air Force. He knew quite well which program caused the length difficulty and although it can’t be discussed in this memorandum, it is clear to both of us that something could be done in this regard also. We both agreed that the payload requirement was somewhat arbitrary at this point. He would come up with his own drawings on what it should look like. He had private sources that he was turning to. Contractors wanting their particular version. Contractors do that. And there is no reason why they shouldn’t. I hate to say this about Don but he really didn’t understand aerospace contractors. Tell him to design a cheaper system, he’d design a cheaper system. He went that far; he came up with his own design. Fletcher took it in stride: “We kept dealing with him. After all, you have to be polite, because you never know who’s going to be your boss next.” Low also joined in the exchanges. At one point, Rice presented a developmental cost of $4 billion and claimed that it came from a contractor whose name he could not divulge. Low asked him to disclose the contractor, so that NASA could critique his claim. Rice refused, but based on the questions he had asked, Low concluded that the contractor was North American Rockwell. That company had given far more information to NASA than to Rice, and Low determined that Rice’s $4 billion left out company profit and the cost of NASA program support. Indeed, it was the equivalent of numbers that NASA itself had shown. Every time Rice got a bright idea, he would send it over to NASA for assessment by its staff. The OMB’s William Niskanen, head of its Evaluation Division, chimed in with similar requests of his own. Within NASA, William Lilly was the chief budget officer and was close to the working level where people had to take the time to deal with these matters. It was some dirty warfare going on at that time. Our approach was to, in essence, to create doubt in their boss’s mind of the value of the work they had done. We did our studies and in many ways in order just to prove that they were biased, and they were wrong and they didn’t know what they were doing. And any way we could embarrass them, we did it. I reached the point, to hell with you, back of my hand to you. I mean, you can’t do your job if I don’t let you in the Agency. And in essence, I probably went about shutting them off from information throughout the Agency. I just told my people that, in a way that they understood, but not really telling them, they weren’t to respond. I wanted to see everything that went over. There was to be no answers to questions given throughout the Agency to OMB without it coming through me personally. We have concluded that the full capability 15 x 60′ – 65,000# shuttle still represents a “best buy”, and in ordinary times should be developed. However, in recognition of the extremely severe near-term budgetary problems, we are recommending a somewhat smaller vehicle — one with a 14 x 45′ – 45,000# payload capability, at a somewhat reduced overall cost. This is the smallest vehicle that we can still consider to be useful for manned flight as well as a variety of unmanned payloads. However, it will not accommodate many DOD payloads and some planetary payloads. Also, it will not accommodate a space tug together with a payload, and will therefore not provide an effective capability to return payloads or propulsive stages from high “synchronous” orbits, where most applications payloads are placed. Fletcher privately knew that he could go still lower. Talking with Low, he decided that they could accept something as small as 14 x 40 feet with 40,000 pounds. The two men then went to an afternoon meeting with White House and OMB officials: Shultz, Weinberger, Flanigan, David, Rice and Rose. Shultz was now the key man; he headed the OMB, he was Rice’s boss, and he had Nixon’s ear. Shultz looked at NASA’s presentation and decided that the only thing that made any sense, as NASA had said all along, would be the full-size version, Case 4. Shultz, however, did not press this point for Rice objected vigorously. Rice’s staff was still active; only one day earlier, his economist John Sullivan had sent him a memo arguing anew that the most cost-effective system was still the Titan III. The meeting broke up with no decision. Fletcher and Low, however, came away fairly confident that they would at least get Case 2A, which they had recommended. Indeed, Shultz’s support, however tentative, allowed them to hope that they might even win the full-capability Case 4. Rice again prevailed, as he talked further with Weinberger. In a phone conversation with Fletcher, Weinberger stated that he wanted NASA to look at a 14 x 45-foot Shuttle — with 30,000 pounds of payload, only two-thirds that of Case 2A. In Low’s words, “Fletcher came close to telling Weinberger to go to hell but restrained himself perhaps better than I could.” Fletcher then phoned Shultz and talked with him at length. Shultz remained unwilling to make a decision, but recommended that NASA should take one more look at Rice’s request. Although Rice was holding firm on a weight of 30,000 pounds, he now was willing to budge slightly on payload size, for Sullivan’s memo had discussed a 12 x 40-foot shuttle with twin solid boosters. Though this configuration would carry no more weight than a Titan III, it could fly with the boosters of a Titan III: 120-inch solid motors that were in production and had known costs. Such a Shuttle still would not match the cost-effectiveness of the Titan III itself, but it would come close. In Sullivan’s own analysis, that Titan would save only $100 million when compared to that Shuttle. Within the OMB, this was as near to an endorsement as any type of shuttle was likely to receive. 1. 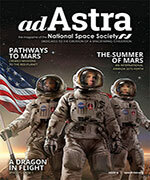 If future budgets for NASA were constrained to $3.2 – $3.3 B, would you want to do a large shuttle? 2. Why should a relatively few space station modules for the mid-1980’s determine the size and weight capabilities of the shuttle? What other missions are really driving the payload size and weight requirements? Answer: In addition to “a few space station modules,” the payload length is driven above 40 feet by most NASA planetary payloads, most DOD payloads, and a few of the NASA science payloads…. The payload diameter is driven above 13 feet by manned payloads, some NASA science payloads, and some NASA planetary payloads. The payload weight is driven above 40,000 lbs. not only by space station modules but by space station resupply logistic vehicles, as well as sortie cans [small laboratories that would not fly freely in space but would remain within the payload bay and return with the Shuttle orbiter]; a 40,000-lb. payload capability is also exceeded by many DOD payloads, as well as 13 different science, applications and planetary payloads. 4. What capabilities and dollar benefits would be lost by going to a 12 x 40′ (30 – 35,000 lb.) shuttle launched by SRM’s? Our view that the shuttle with the 14×45 – 45,000# capability is the minimum acceptable option is still valid. The OMB proposed option of a 14×45 – 30,000# shuttle is not acceptable because it will not handle manned space station modules, manned sortie flights or manned resupply missions in a standard space station orbit: in short, it would not provide a manned spaceflight capability for the United States. Also, this shuttle would not handle 28 different science, applications and planetary payloads that could be carried with a 45,000# payload capability. At 6 p.m., Fletcher and Low met in George Shultz’s office with a group of participants that again included Shultz, Weinberger, Flanigan, Rice, and David. The opponents’ positions remained the same, with Rice calling for a smaller design and David proposing that they put off a commitment for several months, to give NASA time to refine its most recent estimates. Shultz responded differently. Unlike those critics, he had been at Key Biscayne. He had given Rice full opportunity to raise his objections. Now, in this meeting, he had seen NASA respond to Rice’s questions, with answers that militated strongly against the OMB Shuttle. What happened next proved to be the hinge of decision. Lilly: Rice got a little bit confused. There was a feeling with Low and Fletcher that Rice got too carried away, moving toward misstatements, trying to exaggerate some things. George Shultz picked up the phone and called Morgenstern during the meeting and asked him about it. Now, NASA had prepared for this kind of thing-to be sure Morgenstern was fully knowledgeable. And Shultz got off the phone and made the decision-we’ll go this way, and to prepare the papers for the approval. Donlan: I get this directly from Dr. Fletcher. He was telling his wife the story of how he went over there with the information that I supplied him from our shuttle program studies that showed that there wasn’t all that much to be gained by going 45-foot length and, furthermore, it invalidated a lot of missions that the Air Force claimed they needed for the sizing of the satellites. So Shultz said, ‘Well, what are you fooling around with that 45-foot configuration for? It doesn’t cost that much more. Why don’t you get the one you want — take the 60-foot one.’ And Fletcher came back with that message. That’s how it was settled. Willis Shapley, NASA Associate Deputy Administrator: George Shultz — he had personally spent almost as many hours going through all the planning studies, and especially this famous economic analysis that Klaus Heiss at Mathematica had done. And he personally called up Oskar Morgenstern and other people there, and he was satisfied, finally, that it was a reasonable proposition. So when it was clear that all the boys made their case, Shultz said, ‘If we’re going to do it, let’s do it right; let’s do the big shuttle and forget about the Bureau of the Budget shuttle.’ So that’s how we ended up with what it was. 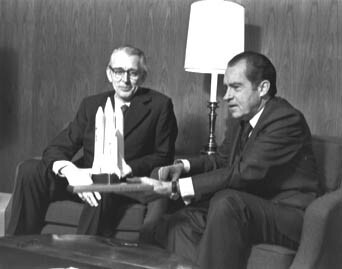 The decision to proceed with the Shuttle became firm during the meeting in Shultz’s office, with Shultz confirming his assent to NASA’s request for $200 million as startup funds for the Shuttle within Nixon’s FY 1973 budget. Flanigan now asked Low and Fletcher to prepare a draft of the presidential statement — which Anders was writing already. In turn, Anders’ statement formed the bulk of the material used in Nixon’s release. As recently as November, Flanigan had anticipated that any White House announcement would be low-key. At that time, with the $3 billion glider as the likely new initiative, Flanigan expected to see the main coverage limited to the aerospace trade press, thereby reassuring this industry of Nixon’s support while avoiding the high visibility that would draw fire from critics. The Shuttle, however, had metamorphosed now into a $5.5 billion program. As early as the previous Friday, prior to the meeting in Shultz’s office, a White House staffer had already laid out the high-profile announcement that now was scheduled for Wednesday, January 5, 1972. He liked the fact that ordinary people would be able to fly in the Shuttle, who would not be highly-trained astronauts. He asked if the Shuttle was a good investment, and agreed that it was indeed, for it promised a tenfold reduction in the cost of space flight. He added that even if it was not a good investment, the nation would have to do it anyway, because space flight was here to stay. Fletcher came away from the meeting saying, “The President thinks about space just like McCurdy does,” referring to a colleague within NASA’s upper management. I have decided today that the United States should proceed at once with the development of an entirely new type of space transportation system designed to help transform the space frontier of the 1970s into familiar territory, easily accessible for human endeavor in the 1980s and ’90s. This system will center on a space vehicle that can shuttle repeatedly from earth to orbit and back. It will revolutionize transportation into near space, by routinizing it. It will take the astronomical costs out of astronautics. In short, it will go a long way toward delivering the rich benefits of practical space utilization and the valuable spinoffs from space efforts into the daily lives of Americans and all people…. Views of the earth from space have shown us how small and fragile our home planet truly is. We are learning the imperatives of universal brotherhood and global ecology — learning to think and act as guardians of one tiny blue and green island in the trackless oceans of the universe. 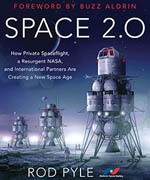 This new program will give more people more access to the liberating perspectives of space…. It was appropriate to give a name to this new ship of space, and of state. Fletcher, Shapley, and Low had prepared a list that included Pegasus, Hermes, Astroplane, and Skylark. Flanigan passed this list to White House staffers, who picked the name Space Clipper. A draft of Nixon’s statement used this name, which resembled Lockheed’s Star-Clipper. Nixon himself, however, decided that it would be better to refer to the vehicle in the usual fashion, as the “Space Shuttle.” Earlier piloted spacecraft had carried names such as Mercury, Gemini, and Apollo, but the new one would break with this practice. Criticism of Nixon’s decision came from the usual sources, with Senator Proxmire issuing a press release: “The President has clearly reordered our priorities. But he has reordered them the wrong way.” Senator William Fulbright played the same note: “I believe the shuttle simply cannot rank high on our list of priorities in view of the critical social and economic problems we face.” They, however, were merely outriders within a Democratic Party that had long commanded the center of American politics but now was slipping to the left, and whose presidential candidate, George McGovern, would shortly receive one of the worst electoral drubbings ever administered. Though Congress would perform its constitutional role by voting the funding, it would not become an important source of opposition. a very important consideration in Nixon’s mind. There are what we call battleground states; they are the pivotal states that control big blocks of electoral votes. So when you look at unemployment numbers, and you key them to the battleground states, the space program has an importance out of proportion to its budget. Weinberger had made an important point in his memo to Nixon of August 12: the United States, as the world’s great reserve of strength, could do more than merely add bricks to the welfare state. Such policies might suit the British, of whom the former secretary of state Dean Acheson had said, “Great Britain has lost an Empire and has not yet found a role.” They would not suit America. One could view Nixon’s decision as a straightforward exercise in daily work at the White House. Nixon had a strong interest in management; he had set up a staff system, which included a strengthened OMB, that could weigh policy alternatives with considerable effectiveness and present him with well-researched options for his decision. As one Flax Committee staffer put it, “Once they decided to do it, Nixon and Ehrlichman weren’t going to argue with NASA whether it ought to be a 60 or a 45-foot-long bay, or 12 or 15 feet. If the head of NASA is telling them that it has to be this size and they want to go ahead with the project, they are going to say go ahead.” The demise of NTOP also helped. While the Shuttle stood on its merits and did not simply replace NTOP as a backup, Nixon and Shultz had been prepared to include funding for NTOP initiatives in the FY 1973 budget. When no suitable proposals came forth, that made it easier to shift the putative NTOP funds over to the Shuttle, and to approve a larger Shuttle as well. Now that Shultz had handed NASA its Shuttle on a silver platter, the agency had to decide how it would look. The question of choosing a booster was still up in the air, and it was far from clear that the Shuttle indeed would be a TAOS; liquid-fueled boosters designed as conventional first stages were making a strong comeback. Similarly, the agency could not simply walk away from Fletcher’s alternative of 14 x 45 feet and 45,000 pounds; NASA itself had proposed it, and it merited additional attention because it offered the potential advantage of being able to use existing 120-inch solid rocket motors. Further study of this design would also discourage the OMB from complaining that NASA once again was abandoning a good possibility with unseemly haste. The Mark I/Mark II concept, however, with its phased technology, had never been more than an artificial stratagem to reduce peak funding by stretching out the development, while accepting serious compromises in design. With Shultz’s support, NASA now was free to build an honest orbiter, one that would be right the first time. MSC-040A had called for four J-2S engines; a variant of January 1972, MSC-040C, replaced them with three SSMEs. Boeing and NASA-Marshall, however, would not be denied, as they proposed a new alternative: a pump-fed booster. Though this again was to be an S-IC variant, it would be without wings, tail, jet engines, landing gear, or crew compartment. Instead it amounted to the standard S-IC, fitted out to land in the ocean by using parachutes. A retro-rocket was to cushion its impact in the sea; it then would float like a ditched airplane as it awaited rescue. After refurbishment, it would fly again. Within the OMB, Daniel Taft, who worked with the NASA budget, saw an opportunity — and smelled a rat. The opportunity existed because NASA’s own estimates proposed that a suitable solid rocket motor would cost up to a billion dollars less to develop than a pressure-fed booster. In addition to this, the Air Force had already developed the 120-inch solids of the Titan III, thus providing a base of experience along with confidence in the validity of the new cost estimates for solids. Pressure-fed versions carried no such experience and no such confidence, for they had never been built before. NASA has recently let contracts with the four major solid rocket contractors ($150 K each) for quick (1 month) studies of development and production costs and technical aspects of SRMs. This is truly a hasty last minute effort by NASA which can hardly be expected to make up for NASA’s failure to study SRMs seriously in the past. Of course, the requirement for Marshall’s involvement in the shuttle program would be quite weak if SRMs were selected. Ironically, Marshall, which has little understanding of SRMs and much to lose by their selection, is managing the SRM contractor effort…. If left to their own desires, NASA would probably select the 15 x 60′ orbiter with the pressure-fed booster. This is regrettable because we consider the pressure-fed booster to be a high risk option from the standpoint of both investment cost and operating cost…. During the subsequent week, contractors presented briefings and gave their recommendations concerning the choice of booster. Low wrote that these briefings “yielded the recommendations for each contractor that were most predictable based on vested interests.” They also were predictable based on the contractors’ choices during a similar exercise six months earlier, when they had compared expendable boosters for interim use. On both these occasions, Boeing’s recommendations had been particularly egregious. By contrast, Lockheed was a major builder of solids. In September, it merely had weighed the merits of competing sizes and arrangements of solids, drawing on this in-house expertise. Now, however, it compared a range of alternatives that included liquid boosters — and found again that solids were best. The February briefing from North American Rockwell was also in character. In September, that company had found no reason to choose between the alternatives of the day. Now it hedged anew, stating that one could choose either solids or a conventional liquid first stage, depending on what cost goals were most important. On the whole, contractor studies found no advantage in the smaller orbiter, no offset to its compromise of NASA’s ability to carry DoD payloads. This removed the last questions as to whether NASA would get the full-size version that it wanted. But with the booster recommendations ranging over the map, NASA once again had no clear way to proceed. Six months earlier, a similar confusion over choice of boosters had worked to NASA’s advantage, by opening the door to new possibilities that included the winged S-IC. The situation now was different; the agency wanted to narrow its alternatives, not expand them. Yet within the contractors’ reports, data on costs gave an overriding basis for a decision. The situation was not completely bleak; the increased cost of the orbiter, as much as $700 million, included $260 million for specialized solid rockets that might be useful in abort. Sullivan noted that the justification for this abort system “seems weak,” and it soon was dropped from the design. As a result, these estimates could be reduced. NASA also had to consider the danger of the sea, for inevitably, some boosters would be lost. The high cost of a liquid booster meant that losing even one of them would be quite expensive. Moreover, although the pump-fed booster would save on development costs through its use of the existing F-1 engine, its thin-walled structure would easily sustain damage while afloat. The casing of a solid booster would cost much less. It would be relatively impervious to damage, and the occasional loss of such a casing would not compromise the program’s overall economics. The director of NASA-Marshall, Eberhard Rees, had expressed hope that the shuttle would use a liquid booster, because that would provide more work for his center. Although he had been deeply involved with liquid rockets since the wartime V-2 effort, he now would have to change with the times. The Shuttle would use two 156-inch boosters, which were as large as could travel on American railroads [a year later this specification changed to a diameter of 142 inches, due to a reduction in the design weight of the orbiter; Loftus et al., Evolution, p. 26; Astronautics & Aeronautics, January 1974, p. 72]. Only nine such solids had been test fired — five by Thiokol, four by Lockheed — and Marshall would have plenty to do in bringing them to a level of reliability that would allow them to carry astronauts. Marshall also would manage the development and production of the SSME and the external tank. This center thus would not wither on the vine. With this, the Shuttle took form in the shape that NASA would build and that flies to this day. Ironically, though it was a NASA project from the start, its main design features reflected pressures from outside that agency. The Air Force had pushed for the large payload capacity and the high crossrange that called for a delta wing; while NASA later accepted these features and made them its own, the initial impetus had come from the Pentagon. Similarly, the solid boosters came from the OMB. Left to its own devices, NASA surely would have picked a liquid booster such as the fully-reusable winged heat-sink type that flourished during the second half of 1971. In this fashion, the Air Force and OMB crafted a design that NASA would construct and operate. NASA now was not only ready to proceed with the orbiter it wanted; it also could look ahead to having most of the principal elements of George Mueller’s integrated space program of 1969, which he had planned to culminate in piloted missions to Mars. That program envisioned a Space Shuttle, approval for which was in hand. It called for a space tug, which was on the agenda as part of the development of the operational Shuttle. Mueller had looked ahead to astronaut-tended spacecraft, including a Large Space Telescope that would take shape as today’s orbiting Hubble instrument. These, too, were in prospect in 1972. Space station modules, launched by the Saturn V, were key elements in his scenario, with variants of these modules evolving into portions of Mueller’s eventual Mars ship. Though the Saturn V would fly no more, Fletcher had pushed successfully for a shuttle that could serve to build a future space station. This effort would come to the forefront during the 1980s. On Capitol Hill, its political support was unassailable. The program had a research center at Los Alamos, New Mexico. The National Journal described that state’s Senator Clinton Anderson as “NERVA’s most zealous and watchful guardian over the years.” Anderson was one of the most senior Democrats in the Senate, and chaired its space committee. The test area was in Nevada; hence the program also held strong support from that state’s Senator Howard Cannon, another influential Democrat who was also a member of the space committee. Indeed, support for NERVA was bipartisan. Westinghouse was building its reactors in Pennsylvania, home to another key supporter: the leader of the Senate’s Republicans, Hugh Scott. In the House, the Pennsylvania congressman James Fulton was the most senior Republican within that chamber’s space committee. He took a strong stand for NERVA as well. Late in 1970, amid preparation of the FY 1972 budget, NASA and the AEC requested a total of $88 million. By then, however, NASA was abandoning Mueller’s bold Mars plan. There was no need for rapid development of NERVA, which was likely to be ready long before any mission could use it. NASA decided to slow it down by lowering its priority. The OMB responded by treating it as a splendid opportunity to save money by canceling it outright. When the smoke cleared, the budget request for NERVA was down by four-fifths, to only $17.4 million. Late in January 1971, at a NASA budget briefing, George Low went out of his way to deny that his agency still was looking ahead to a piloted mission to Mars, saying, “We have in our program today no plans for a manned Mars landing.” He actually had plans aplenty, but he was telling the truth; they were not in the program. NERVA stood at their core, and NERVA by then was dying. The merits of Cape Canaveral were undeniable. In addition to its Apollo facilities, it was on the Intracoastal Waterway; hence barges could bring oversize rocket stages from such locations as NASA’s Michoud Assembly Facility, a government-owned plant near New Orleans that had built the S-IC. The southerly latitude of the Cape also meant that rockets launched from this site would benefit from the earth’s rotation, which would impart a velocity of up to 914 mph while a vehicle sat on its pad. The Cape, however, had disadvantages as well. Though many military launches demanded a polar orbit, but Canaveral could not accommodate rocket flights to due north or south; they might drop spent stages on the Carolinas or Cuba. The Air Force had built its own separate facilities at California’s Vandenberg Air Force Base to get around this. The Cape was subject to corrosion from salt air. It needed a 10,000-foot runway to land the Shuttle, and while this was feasible, the Cape often had cloudy or rainy weather. Lying at sea level, it required rockets to blast their way through the entire thickness of the atmosphere. Nevertheless, there was at least one serious alternative: the Army’s White Sands Missile Range with its adjacent Holloman Air Force Base. Holloman offered existing runways along with a 4000-foot elevation to complement its southerly latitude, thus giving a double boost to a shuttle. Located amid high desert, its weather was virtually cloudless and its flying conditions nearly ideal. An arid climate discouraged corrosion. The remoteness of White Sands also stimulated thoughts of all-azimuth launches, whereby this single facility would fire the Shuttle into both NASA and Air Force orbits. A community of missile specialists had worked here since World War II. This location had another important resource: the powerful Senator Clinton Anderson of New Mexico, its home state, who was ready to fight vigorously for its selection. NASA and industry spokesmen suddenly began pointing out that the shuttle potentially could be launched from almost anywhere in the United States. At that juncture, a number of congressmen discovered that they had phased-down or abandoned facilities or Air Force bases in their districts. So Teague and the subcommittee decided they had better make their position — and that of the full committee — clear from the outset. NASA thus had to do a lot of stroking. In October 1970, George Low assured Senator Anderson that White Sands would receive close scrutiny. The following March, Dale Myers reaffirmed that the competition was far from over, and described White Sands as the closest challenger to the Cape. When, however, NASA announced its decision, in April 1972, it stated clearly that it was not about to build a national Shuttle site in the New Mexico desert. It awarded the palm to Cape Canaveral, with Vandenberg AFB to serve for military launches. I regard this decision as the latest, and perhaps most blatant, example of President Nixon’s calculated use of the American taxpayers’ dollars for his  own re-election purposes…. The award of this contract to North American Rockwell also raises questions of ethics. Why is it that five of the current directors of the corporation happened also to be major contributors to Richard Nixon’s election in 1968? I ask Democratic members of Congress for a full airing of this contract award…. Ms. Westwood’s press statement included a list of the “major contributors,” whose 1968 donations had mostly come to $1000. One wealthy man, Henry Mudd, had given all of $2000. Yet while stating explicitly that Nixon could be bought and sold for the price of a Volkswagen Beetle, she missed a potentially more significant story: Dale Myers, who had spent his career at North American, had put together the selection board that had picked this company as the winner of the contract. The Request for Proposals went out on March 17, shortly after NASA had wrapped up the choice of the booster. Responses were due on May 12, and four companies replied: North American Rockwell, McDonnell Douglas, Lockheed, and Grumman. Fletcher and Low-but not Myers-then reviewed the findings of the board during July, and met with the bidders’ corporate officers. With them was another NASA official, Richard McCurdy. He had just returned from vacation; his secretary had flown to Spain to give him documents so he could read them on the way back. These three men then made the final decision. Grumman, however, was less outstanding in cost and management. Its proposed cost was higher than NASA liked. Fletcher saw why: the firm planned “to build up its work force rapidly to an early manpower peak. This poses the risk of premature hardening of the specifications and premature commitment of resources during the course of the program.” Grumman came in a strong second overall; its excellent design did not outweigh its shortcomings in these other areas. Fletcher, Low, and McCurdy picked this winner on the afternoon of July 26. In Low’s words, “we very quickly determined that all three of us wanted to select North American Rockwell on the basis of the highest score” and “the lowest cost.” They then made phone calls to spread the news. When Fletcher phoned North American, just after lunchtime in California, he found that this company’s executives already had gotten the word. Their local congressman, Del Clawson, had received his own phone call from NASA earlier that afternoon, and beat Fletcher to the punch with a call of his own. His conduct thus contrasted with that of Pratt & Whitney, which had made just this type of formal protest a year earlier, on losing the SSME competition to Rocketdyne. This complaint had the legal status of a lawsuit, directed not against Rocketdyne but rather against NASA, which allegedly had performed wrongful acts in selecting that contractor. With Pratt as the plaintiff and NASA as defendant, Rocketdyne held the role of a highly interested witness whose testimony could help NASA in seeking to uphold this award. The proceedings did not take place in federal court, but rather went forward under the Comptroller General, Elmer Staats. He issued his decision at the end of March 1972, while preparation of proposals for the complete Shuttle was under way. Pratt also complained that “selection of Rocketdyne wastes eleven years” of its experience. Though Pratt indeed had devoted much effort to its XLR-129 rocket engine, Staats concluded that NASA had fairly weighed the merits of this engine and had not overlooked its advantages in determining that “Rocketdyne offered the superior technical approach.” NASA had been obliged to give due weight to the experience of Pratt, and had done this. He concluded, “We believe the procurement was conducted in a manner which was consistent with applicable law and regulations and was fair to all proposers.” The contract award to Rocketdyne would stand; Pratt’s attempt to overturn it had failed. Rocketdyne indeed would design and build the SSME. Because this division was part of North American Rockwell, the subsequent award of the main Shuttle contract to this company’s Space Division gave this firm responsibility for the entire Shuttle orbiter, including its engine. This was more than North American had carried during Apollo, more than it had held since the days of Navaho some 20 years earlier. The events of 1972 brought an end to NASA’s search for a post-Apollo future. The search had begun in 1965, when George Mueller had set up his Apollo Applications program office. This effort led to Skylab, but that offered no more than one more year of piloted missions. Characteristically, Mueller responded by seeking a larger space station that could fly atop a Saturn V. The Shuttle then grew out of this new pursuit, initially as a logistics vehicle but growing to take on a life of its own.